So Walmart (WMT) slowed down… OMG, end of the world! Today, the markets paused their recovery streak and dropped approx. 16 points (-0.58%). I have seen a few panicking about it already predicting the end of recovery and another crash. There are many predicting that S&P 500 will now reverse down and re-test the previous lows. When too many expect one thing, it for sure doesn’t mean that it will happen. However, as I mentioned before, I think, this is not the case. In the past, when markets dropped sharply like what we have seen early in February we saw a recovery and not new selling. 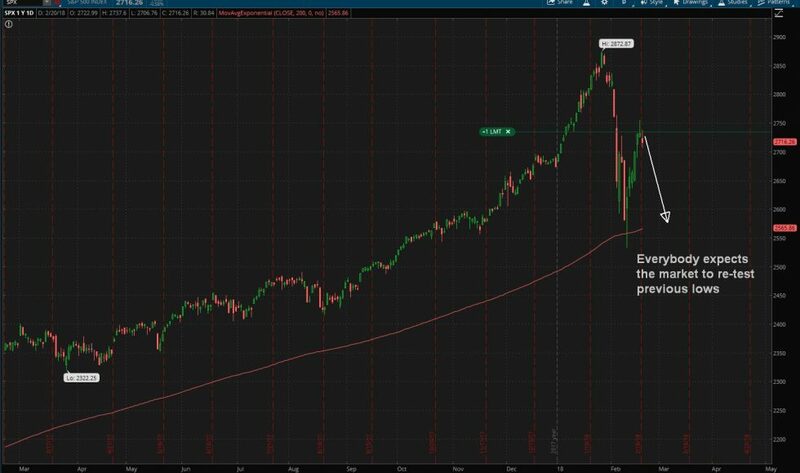 Historically, when the market rallied making 4% gains within 2 months of the rally, then made 1 new all time high within those two months, and then corrected, wiped out all those gains in 7 days then the markets usually recovered withing the next 1 to 3 months. Of course, we will see some ups and downs but we should not see any significant selloff. In fact, I believe, this bull market is not dead and it will make new all time high before the bull dies. It will take time for rattled and spooked investors to finally calm down and realize how foolish they were. And times like this will create great opportunity! In my previous note I wrote that I was deciding which of the stocks to buy using my options trading profits. 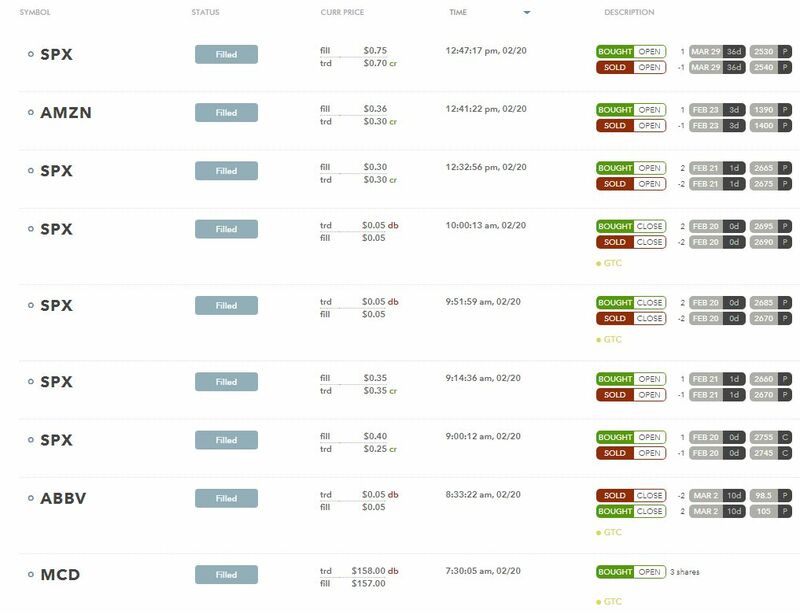 Many of the stocks in my watch list went into “correction” mode and it was really difficult to choose a stock with limited cash. And I expressed a worry that I may have missed my opportunity to buy cheap. It is evident that out of the fear of others, usually those with no investing plan, goal, or rules, this market will provide many opportunities before these same rattled investors find out. So, today, I bought a few shares of McDonalds (NYSE: MCD) with nice and sweet dividend yield of 2.56%. But maybe I was too fast as the market offered yet another great opportunity – Walmart (NYSE: WMT). It is stunning seeing people focusing on the next few months or maybe a year and completely forgetting the long picture. Walmart just mentioned slowing e-commerce and missed one quarter and they are freaking out. The company was founded in 1945 and thrived since then. That is 73 years long story! It is a dividend aristocrat which paid and increased dividends for more than 50 consecutive years! And all those so-called “investors” out there suddenly think it will be over? End? They may be rattled over slower growth but as long as WMT keeps paying and increasing the dividend, all this is all nonsense and to me a great opportunity to buy more shares. There is yet another perspective – online business competing with Amazon (Nasdaq: AMZN). At first, I thought Amazon has an unprecedented edge of an innovative and industry disruptive approach and business drive. I thought that Amazon will have no competition at all and that it is a huge threat to all bricks and stone retailers. Walmart proved me wrong again. Our total day trading balance was + $216.00 dollars. A time of crisis is always a time of opportunity. Your strategy during the bull market is brilliant. I bet a lot of people new to investing are learning a lot when they read your site. You could be molding the future investing minds of Yacktman. Don’t feel bad, Walmart surprises us all.